What a lovely little book! I decided to reread it over Christmas break after hearing the news. And I agree wholeheartedly with what was said over at bookshelves of doom: I'm not much for sequels to classics, but Hilary McKay can do whatever she wants. Anyway, I hadn't read A Little Princess since I was a child. My mother and I read it together, if I recall correctly. I remember loving it then. I remember seeing the movie. I remember thinking "Wow, they changed a LOT." So, when I came back to the book, years later, I had all these movie memories. The book surprised and delighted me all over again. Sarah is a little British girl who lives in India with her father. At the beginning of the novel, she is sent off to school. She is so brave! So kind! So with-it. Despite teasing peers and her slightly odd looks, she does her best to act like a princess. When she becomes suddenly penniless, the headmistress employs her as a maid. She struggles with her identity, the physical labor involved, and just with growing up. The plot is complimented by beautiful description and detail. I've been thoroughly enjoying old fashioned books lately: The Penderwicks, The Willoughbys, The Keeper of the Bees, etc. This won't be the last one I pick up. Also it made me want to learn French. 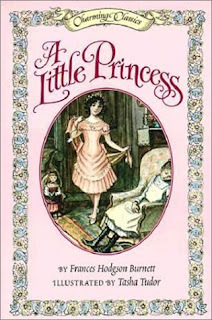 I didn't realize Frances Hodgson Burnett wrote A Little Princess. I'll have to check it out. I just re-read this one, too, Alysa. I love it so much! I'm intrigued by the idea of this sequel, though, like many, I'm generally opposed to such things. Jenni - me neither until this reread! crazy, huh? Melissa - Yessss! I've hooked my sister. Jen - What a coincidence! We shall have to see how it turns out.